Scroggins, Alma Grace Elliott (9 Feb 1932 - 2 Apr 2011) . Gaylon "Scotty" Scroggin, 85, passed away April 17, 2011. He was born June 7, 1925 to Larkin  and Rachel  Scroggin in Vamoosa, Oklahoma. Gaylon served in the U.S. Navy from 1943-1946 during WW II. After his discharge from the Navy he went to work for OG&E until his retirement in 1985. On July 20, 1946 he married Kathleen Wilburn  and from this union was born one precious daughter Phyllis. Gaylon loved "Tinkering" in the shed and working with his hands, which showed in his cabin that he built on Lake Eufaula. He spent over 10 years as a league bowler and was also a 55 year member of the Siloam Mason Lodge in Oklahoma City. He was preceded in death by his parents and his wife of 62 years, Kathleen. Gaylon is survived by daughter Phyllis  and her husband Earl ; grandchildren Shanna Byrd and husband Jason, Kelly Stubblefield and fiance Sarah and Alex Stubblefield; as well as great grandchildren Riddick and Trinity Byrd. Services will be held 10 am, Friday, April 22, 2011 at Chapel Hill Funeral Home. Visitation will be held Thursday, April 21, from 12-8 p.m.
Scroggins, Viola Irene Smith (26 Feb 1929- 11 Apr 2011) . 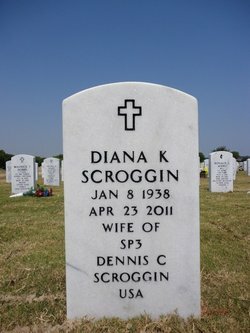 Wife of Scroggins, Mike ( - ) . Scroggins, Connie K. Ruffner (7 Apr 1947 - 2 Apr 2011) [38214:P]. Widow of Scroggins, Paul Stanley (9 Sep 1946 - 13 Apr 2003) [38212:P]. Scroggins, Alma Grace Elliott (9 Feb 1932 - 2 Apr 2011) [32674:K]. Wife of Scroggins, Edwin William (3 Jan 1930 - ) [32673:K, fb].